Just a quick graduation card. School colors were alittle harder to match up, but I did my best. 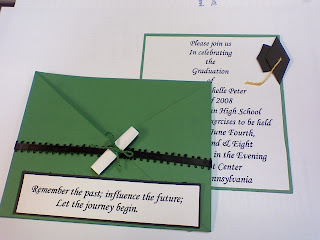 The graduation cap is on a dimensional, and the diploma is just rolled copy paper since card stock was too thick. Anouncement wording was gotten off the internet, which saved some time, since I only had about a week to do them! Oh, well. She loved them!